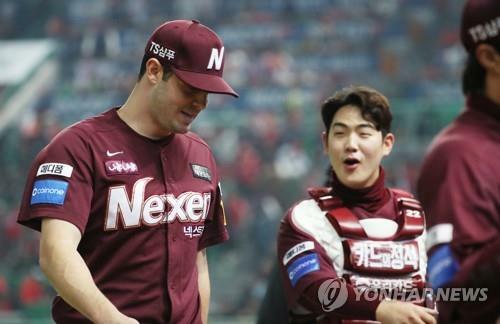 INCHEON, Nov. 2 (Yonhap) — Given what they’ve gone through on and off the field all season, that the Nexen Heroes have come this far in the South Korean baseball postseason — one win shy of reaching the championship series — is an accomplishment in and of itself. In the deciding Game 5 of their Korea Baseball Organization (KBO) playoff series on Friday, the Heroes rallied from a 9-4 deficit with two outs in the top of the ninth, and took a 10-9 lead into the bottom of the 10th. 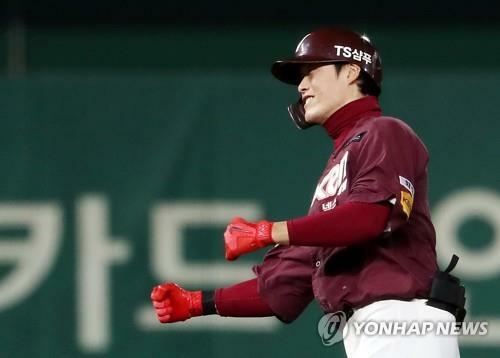 But the Wyverns’ fire power was too much for them to handle, as Kim Kang-min and Han Dong-min hit back-to-back solo homers to pull out an 11-10 victory. The Heroes dropped the first two games, and then fought back to win the next two to tie the series. But in the win-or-go-home showdown, the bullpen that had performed admirably in the past two games couldn’t do it for a third straight game. The relief corps coughed up a 3-0 lead early, and with all key pieces spent, right-hander Shin Jae-young was left in for the final 1 1/3 innings and served up both of the homers in the fateful 10th inning. This was still a solid run for the Heroes, a team that many didn’t expect would get this deep into the postseason. The Heroes experienced trouble even before the start of the season, when their CEO and owner Lee Chang-suk was convicted of embezzlement charges in February. In May, their closer and catcher, Cho Sang-woo and Park Dong-won, were charged with sexual assault, and were suspended indefinitely. The following month, their No. 1 starter, Esmil Rogers, was lost for the season with a hand injury. That wasn’t all. Choi Won-tae, the team’s best homegrown starter in the midst of a career year, suffered an elbow injury while pitching for the national team at the Asian Games in August, and hasn’t pitched since. The Heroes weathered the storm and made it to the postseason for the first time since 2016. But on Oct. 20, in the first round against the Hanwha Eagles, left fielder Lee Jung-hoo, the reigning KBO Rookie of the Year and their leadoff man, suffered a shoulder injury while making a diving grab. He was later ruled out for the rest of the year. The Heroes’ depth was severely tested, not to mention manager Jang Jung-suk’s ability to plug in the holes. And their Game 5 loss notwithstanding, the Heroes did an admirable job pushing the Wyverns to the limit. In the absence of Choi Won-tae, right-hander Han Hyun-hee and left-hander Lee Seung-ho delivered strong starts at the back end of the rotation. Han was the winning pitcher in Game 3 after allowing two runs in 5 1/3 innings. Lee, a 19-year-old rookie, tossed four shutout innings in his Game 4 start. The bullpen also did yeoman’s work. An Woo-jin, Lee Bo-geun and Kim Sang-su were the three workhorses, pitching in four games in the series. An, in particular, had a coming out party this postseason. After tossing nine scoreless innings in two outings in the first round, An pitched 6 2/3 more in this series. But he was running on fumes by the time he took the mound with the score knotted at 3-3 in the sixth inning Friday, and he allowed a go-ahead, three-run double to pinch hitter Choi Hang. The Heroes didn’t get nearly enough production out of their big bats against the Wyverns. Despite manager Jang’s continued show of faith, cleanup Park Byung-ho batted just 3-for-22, his game-tying, two-run homer in the ninth inning on Friday being a classic case of too little, too late. Kim Ha-seong, a hard-hitting shortstop, was moved down from fifth to seventh during the series and batted 3-for-22. The Heroes finished fourth in the regular season and beat the Kia Tigers in the wild card game before getting past the Eagles in the first round. They were trying to become the first wild-card winner to reach the Korean Series since the introduction of the extra play-in game in 2015. But with their talented young core having now had a taste of postseason baseball, the Heroes should be a threat to make another run next season, especially if they get all the pieces back healthy. Nexen manager Jang Jung-suk said he was grateful for everything his players had done for him, regardless of the situations he put them in during the season and this series.